Files can be uploaded within a section (week or topic) within a Moodle course. These files can be accessed by your students when they click the link to the file resource. To add a file, see the article Moodle 3: How To Upload a File. In the General settings, the instructor can designate a title and provide a description of the file. This is also where instructors add the file. 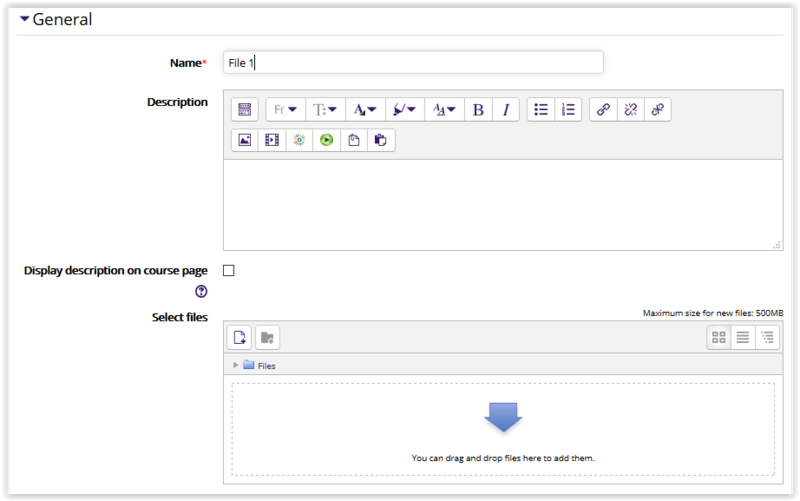 For more information on how to add file, see step 5 in the article Moodle 3: How To Upload a File. The appearance settings allows an instructor to make specifications about how the file will display, the size, type, upload date, etc. Instructors can designate the size of the pop-up box, if that display type is chosen, by click on "Show more...." The display options are: Automatic, Embed, New Window, Force download, and In pop-up. These settings specify the visibility of the file for students (Hide/Show). The file can be restricted based upon a date, group, activity completion of another activity/resource in the course, etc. NOTE: If more than one restriction is added, students must meet EACH of the requirements before the file becomes available. By default, students can manually mark the file as complete, but an instructor can change this to be required. If required, the students can be marked complete by viewing the file.